Boat. Ski. Fish. Float. Paddle! More fun than you can stand! With 3,050 acres and 78 miles of shoreline, you can play all day and never get bored. This Lake was built for flood control and opened in 1983, but didn't become Taylorsville Lake State Park for another 2 years. There's a lot of history surrounding the Park. Read about it here. There are four boat ramps. Those with amenities are the State Park ramp with a Marina for all your Lake needs, and Possum Ridge Boat Ramp off Park Road where you'll find covered picnic areas, overnight/primitive/day/equine camping and the Park Manager's office. 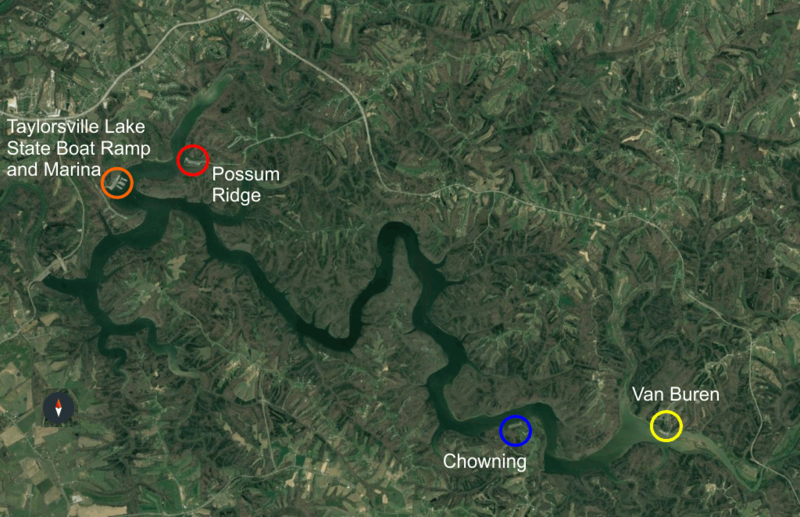 Chowning and Van Buren ramps are remote, quiet and have abundant wildlife. Numerous events happen at Taylorsville Lake. Check our calendar to see what's coming up next. While you're there, check out the picture of the HUGE catfish caught here (and then released)! Just an FYI, there's no swimming except at the Dam. And we're working to make it even better! Friends of Taylorsville Lake State Park has been working hard to clean up Possum Ridge Boat Ramp, used by many boaters, kayakers and paddleboarders. We remove debris from the handicap ramp and boat launch area as often as possible and as much as needed. BUT WAIT! There's More! We're working on getting a kayak launch ramp installed at this location. It will be the first in a Kentucky State Park, making the ramp area safer for everyone and certainly more convenient for paddlers! Want to help out or get more information? Click here.